A hot water bath is something that everybody wants on a chilly wintery morning before leaving for work or after returning energy drained from office. Here's something that would just need your command and it will start pampering you with a hydrotherapy that works wonders at such occasions. We're talking about the Safeflo Plus from the house of V-Guard. It doesn't weigh much and is a safe option and it goes perfectly with your kitchen and bathroom decor. Like nothing can be compared to a hot water bath after a hard day's work, nothing can be compared to the Safeflo Plus water heater either. It has a slim and compact design which can be conveniently wall mounted in your bathroom or kitchen. Its water storage capacity is sufficient for a small to medium sized family. Its claim to fame is its energy efficiency and cost effectiveness along with a beautiful look. It is utilised to heat water that can be used for sanitary as well as other purposes. 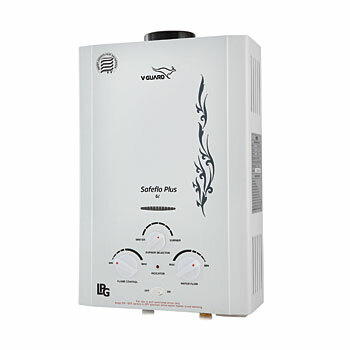 In fact the main idea of setting up an efficient geyser is to ensure a hot water therapy at any time of the day. And the V-Guard Safeflo Plus successfully manages to fulfill all this without any hassles.